In today’s business world, the pursuit of a specific target market in considered to be a fundamental aspect of a firm’s marketing strategy. While mass marketing (having a broad marketing mix designed to appeal to most of the population) was commonplace up until the 1950’s (and still exists in some industries today) it is generally not an effective approach and is usually exposes the firm to many competitive threats. One of the first concepts that students in Marketing 101 (or marketing principles of marketing fundamentals of some other introductory marketing course) learn about is the marketing concept. The marketing concept is where the organization’s marketing strategy is focused upon satisfying the need of a specific target market. The firm then sets out to structure and implement a suitable marketing strategy that will meet the needs of their selected target market/s. So what is market segmentation? Market segmentation is the process of dividing an overall market (as defined by the firm; please see the section on how to define a market) into sets of consumers that have similar needs or similar characteristics. In simple terms, market segmentation means categorizing consumers into similar sets, where each group consists of consumers who are similar to each other in some way. Each of these groups of consumers is then referred to as a market segment, or a piece of the market. Please note that, at this stage, the firm has not evaluated nor selected which market segments that they will target (or market to). 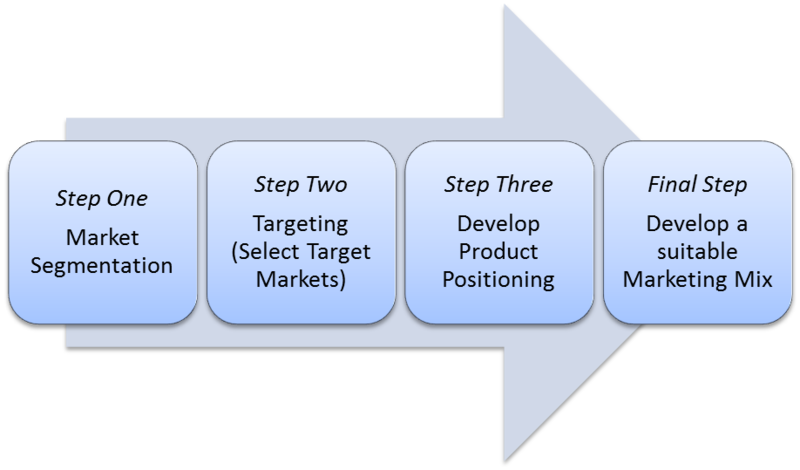 Once a firm selects specific market segments for their marketing and strategy purposes, these chosen market segments will then be referred to as target markets. Therefore, there should always be more market segments than target markets, as firms will typically choose to focus their efforts on a few specific market segments only. There are many reasons for adopting this focused approach, which are explored in the section discussing concentrated or differentiated marketing.